The Canadian Army Medical Corps tried to help the wounded in front-line "hospitals." Here, a medic attends to the wounded as stretcher-bearers return from the front with a new group of battle casualties. The great plume of smoke shows just how close the hospital is to the front lines. 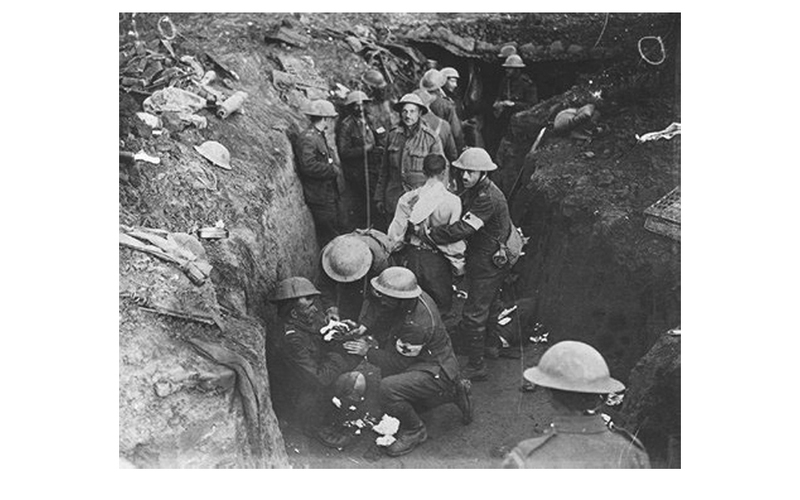 Like other soldiers on both sides, Canadian soldiers lived and died in these trenches. They were both home and graveyard. Here, they joked with their comrades, wrote letters home, slept, ate, played cards, faced their fears, and dared to dream of better days. 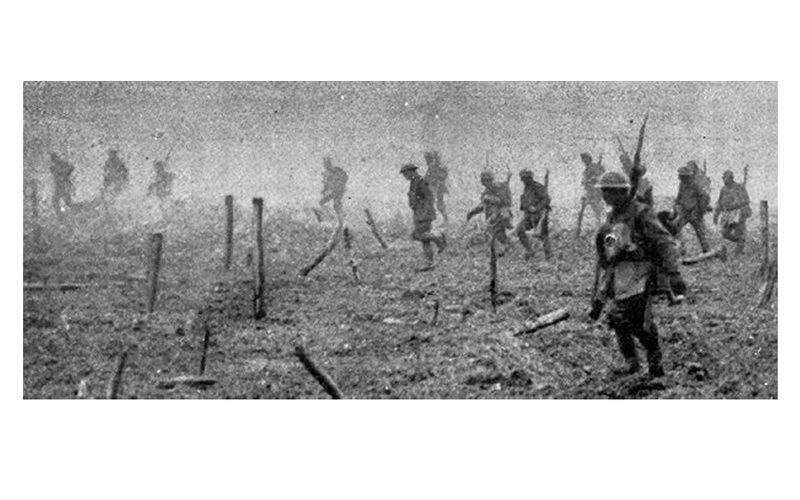 In cold, wet weather, the trenches were transformed into sodden mud holes. Insects and rats were everywhere. The smell of human waste, decaying bodies, and garbage was often unbearable. Soldiers could go for weeks without a chance to bathe. Keeping dry was impossible because of the rain and mud. In such horrendous conditions, even small wounds could become dangerously infected. Trench foot, a painful disorder caused by consistent wet and cold, was common. In many cases, amputation was the only treatment. Clothes became lice-infested. And the food, generally bread and corned beef, was monotonous. The Fortyniner, No. 6, December 1916, pp. 21-22. "The Experiences of a Conscientious Objector," by "Sandbag." "Sandbag," a novice war correspondent, describes his first battle experiences. Canada: An Illustrated Weekly Journal, 4 December 1915, p. 270. 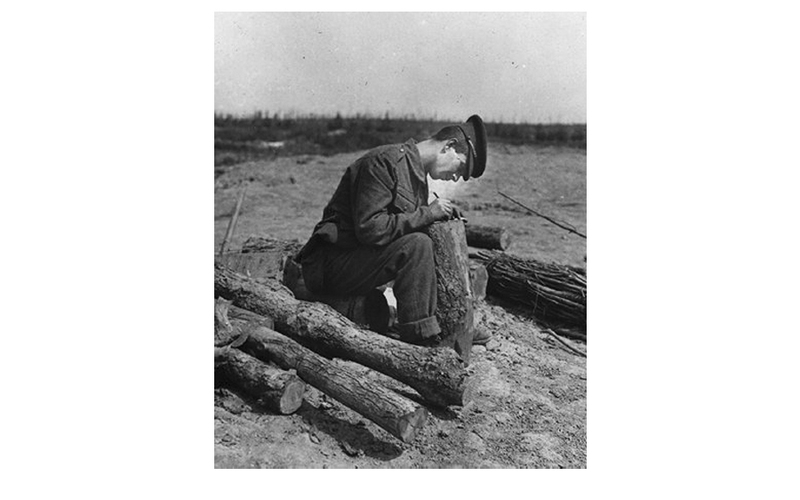 Avoiding trench foot was a major concern for Canadian soldiers. The condition came from having constantly wet feet and could result in serious infection that sometimes led to amputation. 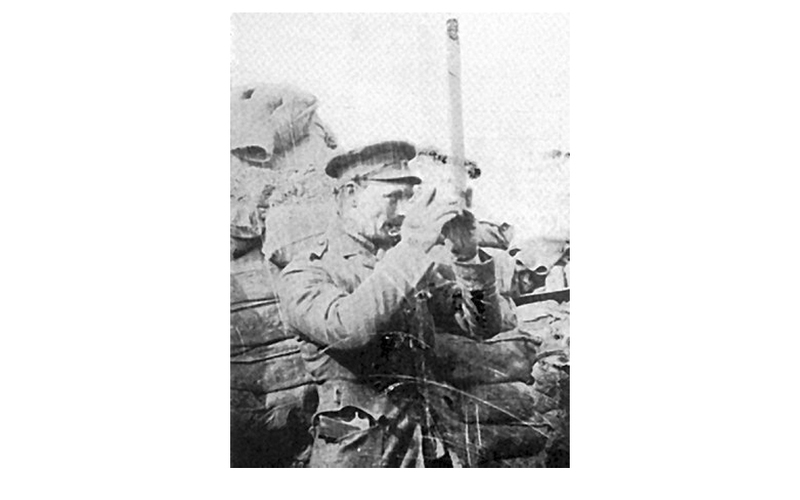 Soldiers could hear their enemies in the opposing trenches, which heightened their terror, already at a high level because of artillery attacks. Night raids, a Canadian Corps trade-mark skill passed on to other allied armies, meant savage hand-to-hand combat where picks and clubs rather than rifles and bayonets were the weapon of norm. 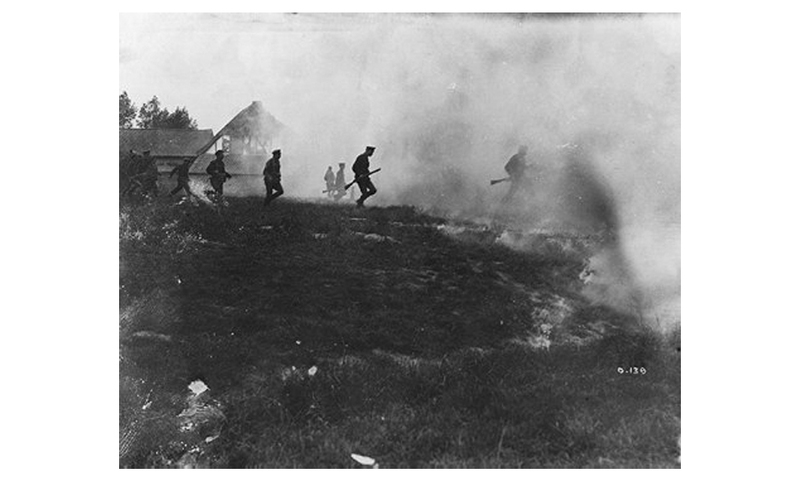 Attacking under smoke, June 1916. Using a periscope to watch the Germans. 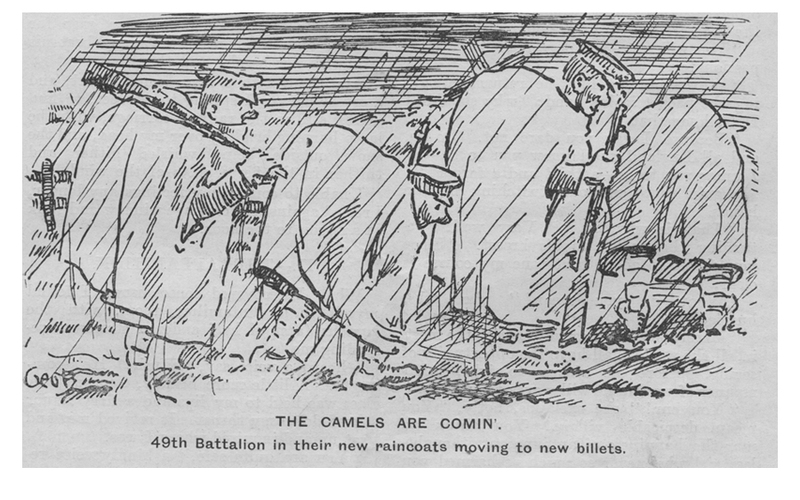 Soldiers joked about looking like camels in the rain. 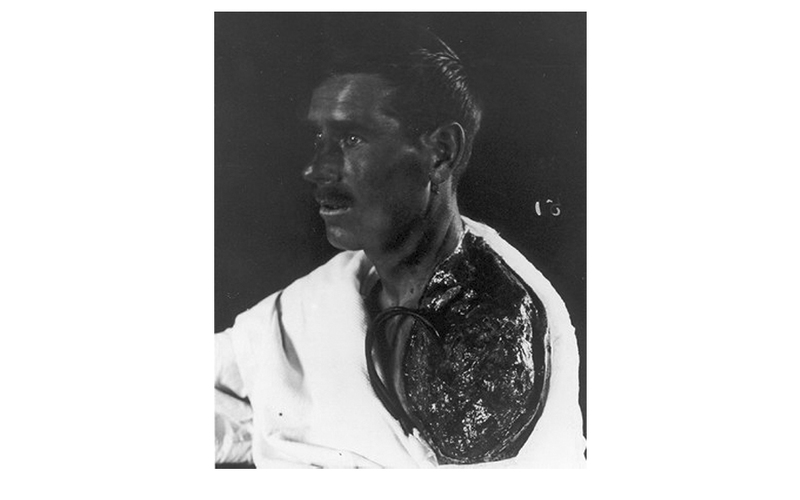 Canadian soldier, left arm blown off. National Archives of Canada (PA-000528). National Archives of Canada (PA-000169). The Fortyniner, No. 3, 1915 (cartoon by George Brown). National Archives of Canada (PA-149316). National Archives of Canada (PA-000627). National Archives of Canada (PA-149311). The Fortyniner, No. 9, July 1929, p. 11. This matter-of-fact description of the heroism of The Loyal Edmonton Regiment's Bill Hannigan suggests that such bravery and sacrifice was not uncommon. Major offensives took place at dawn as soldiers went "over the top" to face machine-gun fire, explosive shells, and artillery. Some would become entangled in barbed wire. Others would be badly wounded and unable to move. Trapped in "no-man's land," where they could not be safely reached, they might die a slow, agonizing death. 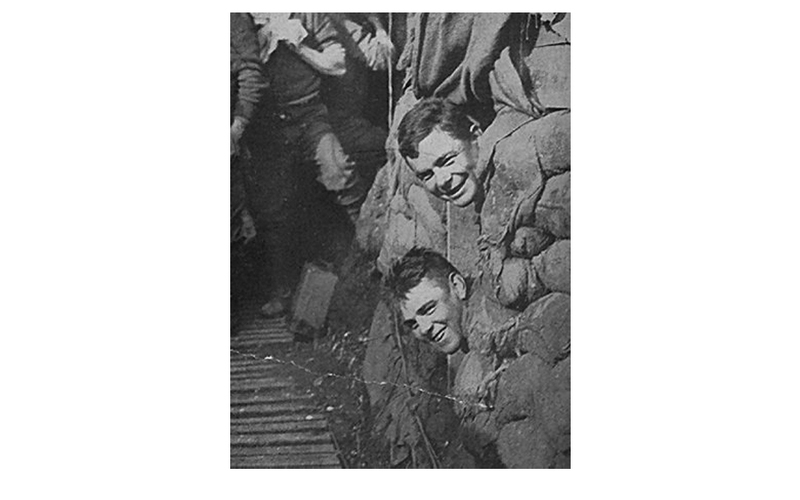 Trench warfare was one of the most terrifying aspects war for the soldier.